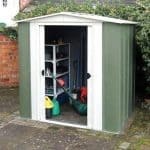 We found a lot of features in this mid sized metal shed that we’d usually expect to pay a lot more for, making this a great buy for people who want a versatile shed for their garden without having to make a substantial outlay. 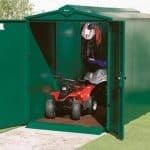 Unlike some other sheds we review, this one does not suffer in terms of height, giving a good all round storage capacity. That makes it ideal for taller items like a garden hoe as well as wider or heavier objects such as a mobility scooter. Whatever you’re bringing in or out, you’ll find it very easy thanks to the sliding double doors fitted internally, and the wide entrance and exit ramp. If the security is improved by the addition of a good quality padlock, sadly not included here although the doors are padlockable can be a secure storage facility that you can rely on in all weathers. How well a shed stands up to weather is very important in this country, which is why we were pleased by the apex roof, always a useful aid in the fight against rain, and by the galvanised metal cladding. It’s rust resistant, tough and surprisingly stable for a lightweight shed. 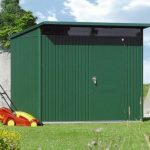 This metal apex storage shed takes the traditional look of a timber shed and gives it a modern twist with a green and off white colour scheme. We found it pleasing to look at, and a change from the standard metallic silver look of many metal sheds. It’s just one of the things that the owner will find pleasing, including the excellent water repellent features and the generous internal volume. Both of these attributes are assisted by the rain deflecting apex roof. 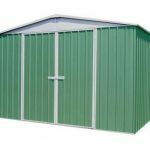 Made of the same tough cladding as the rest of the shed, the roof has a ridge height of 1.93m and an eaves height of 1.78m which is equivalent to 5’10 and is much higher than that in some metal sheds we review. The overall width including overhang is 1.83m and the depth including overhang is 2.16m. Keep in mind that your base will have to be at least this size. We found the metal cladding on this shed to be slightly lighter and thinner than that used in sheds by some other manufacturers, and yet that didn’t equate to a flimsy feel once it was assembled. The reason for this is the combination of three layers, as well as the thicker and stronger frame. The base of the cladding is high tensile steel, but this is then bonded with zinc during galvanisation. After this, three coats of paint are put on, both inside and out. The finished effect is a resilient and stable shed. 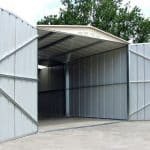 We don’t expect to see floors provided with metal sheds, but we do expect to see an anchor kit included that’s required to attach the shed to a suitable area of concrete, patio, or paving. Unfortunately in this instance a set of Hilti screws have to be purchased separately. Alternatively, a steel foundation kit which can be used to construct a concrete base, or a timber floor support kit are available. All of these three optional extras are stand alone, and don’t require either of the other elements. 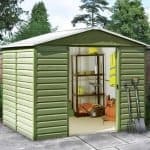 When we review sheds that cost less than three hundred pounds, we often find 10 or 12 year warranties against rust damage. That’s why we were so impressed by the 20 year warranty offered on this occasion. In all likelihood, thanks to the rust resistant properties of the galvanised cladding, gables and roof, the warranty won’t be needed, but it provides peace of mind and added value nonetheless. As with all metal sheds, no treatment is required in order to keep the warranty valid. We see so many short roofed metal sheds, that it was a welcome change to see one that has double doors as accommodating as these. The width of the doors is 0.69m, and the height is a taller than average 1.70m. When allied to the sturdy full length ramp it becomes very easy to move objects of any size, shape and weight in and out. The sliding doors themselves are fitted internally, giving them added protection against potential intruders. As with many metal sheds we review there are no windows, but on this occasion a skylight or a side window can be added at the time of purchase. Whether these options are taken or not, the shed will still be served by ventilation panels built into the panels. These help to stop internal temperatures from getting too high, and can also help in the fight against condensation. The lack of windows helps to stop passers by seeing what’s inside, so we welcome that as a helpful security feature. Security could have been further enhanced, however, by the inclusion of a padlock, although they can be bought separately at little cost. If security is important to you, then you may also want to consider adding a shed alarm. While we appreciated the security boost that having no windows provides, it’s always good to have natural light if you’re going to be spending any time inside the shed. Because of the extra headroom we can imagine people using this shed as a little workshop or office, and the optional extras of a skylight and sliding window both facilitate this. With styrene glazing included, you won’t have to worry about shattering, which can be especially reassuring if you have children or pets near the shed. Another optional extra we welcomed are the single, double, and triple shelves. These come in either corner or rear shelf varieties, and can simply be screwed directly onto the cladding to give valuable extra storage space. The paintwork is immaculate inside and outside, so we could see that this was a high quality metal shed from the first moment. This opinion was reinforced throughout our time reviewing it. We weren’t surprised to see a 20 year warranty against rust perforation, as this is testimony to the quality of components and its rain repelling design. For a small to mid size shed such as this one, every inch counts, which is why the apex roof and tall eaves make a positive difference. We managed, between two of us, to construct this shed in around five hours, but be prepared for it to take longer and be sure to read the instructions carefully as some instructions refer to sheds of other sizes within the same range. 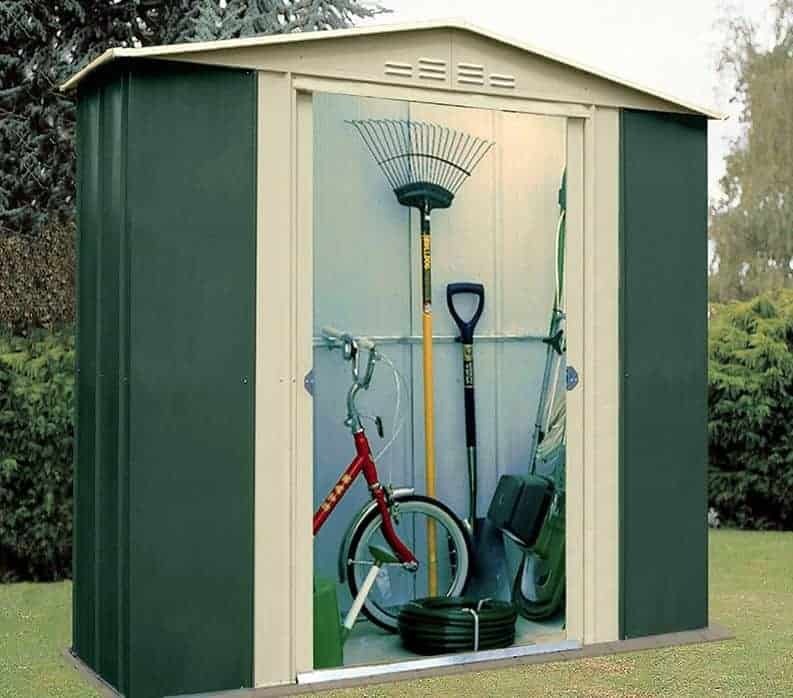 Whilst there are some minor elements we would have liked to see included as standard, namely a padlock and an anchor kit, these are inexpensive to buy so do not detract from the overall good value of this shed. Final Thoughts: What we like most about this shed is that it should still look as good in two decades’ time as it does on the day it’s first constructed. We also liked the host of extra features that are available, from skylights that let natural light flood the interior, to strong shelving that can keep tools organised. There’s even the option to add a timber floor, although we would recommend purchasing the Hilti screws and anchoring the shed to a pre-existing area of level concrete if you want to keep costs down. Overall, this is a good value, durable metal shed that stores more than you might think at first sight.